In all my years of dealing, I have come to find that the word “antiques” means different things to different people, and the determining factor has more to do with the age of the person than the age of the item in question. A teenager, for example, would most certainly refer to the brick-like cellphone I carried around in 1992 as “an antique,” while a baby boomer wouldn’t give it a second thought. The fact is, we each subconsciously cobble together our own ideas of antiquity based on our individual chronological viewpoint. This nebulous quality has also seeped into the world of antiques a bit. In the Tariff Act of 1930, U.S. Customs defined antiques as objects that were made prior to 1830 when mass production became common. That definition was changed in 1966 when “100 years” was adopted as the accepted criteria for determining if something was antique. This was amended again in 1993 in the North American Free Trade Agreement Implementation Act to deal with the issue of items that had been restored. In a time when so many antiques – such as armoires, for example – have been altered to accommodate large televisions (Remember when they weren’t flat? ), I think this distinction is important even if it was originally intended for duty purposes. But, again, that’s a personal feeling. The fact is, if it doesn’t matter to you, it doesn’t matter…unless you think you might re-sell it. As I’ve said before, just because it’s old doesn’t mean it’s gold. Even if an item meets the 100-year requirement, it may not hold any appreciable intrinsic value just because of its age. Rarity, quality, condition and provenance are what determine if an item is truly valuable. Finally, let’s have a word about the term “vintage.” It is a term that originated with wine and was used to describe the year a particular wine was made and bottled. It was later loosely adapted and used to describe anything made in a past time, but the specifics of that can be frustratingly vague when it comes to paraphernalia outside of wine. 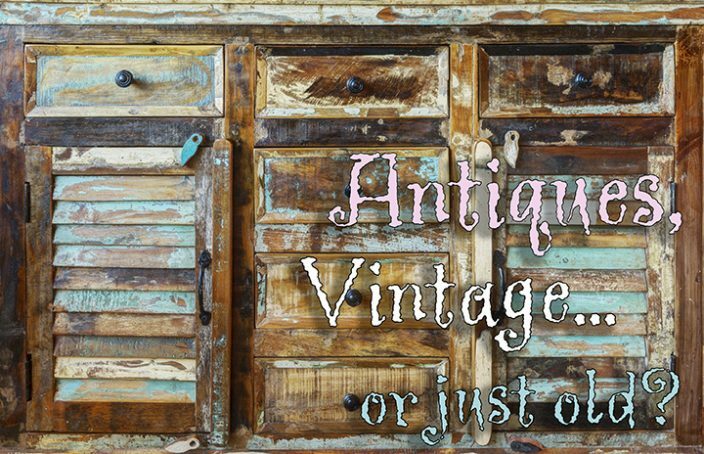 Frankly, “vintage” to me will always connote “collectible,” not “antique.” And, really, there’s nothing wrong with that, but be aware that this term is used a lot and misused. As with all things, a reputable antiques dealer removes much of the anxiety often involved with these considerations, as they will want to represent their merchandise as accurately as possible. So, know your dealer…but know your facts even better. You’ll have the opportunity to put this newfound knowledge to use at future Palm Beach Show Group events. Up next is the New York Art, Antique & Jewelry Show on November 20-24, followed by the Palm Beach Jewelry-Antiques-Design Show on December 3-7.